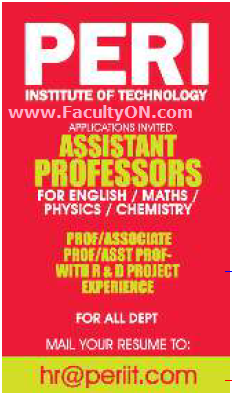 PERI Institute of Technology, Chennai has advertised in THE HINDU for the recruitment of Professor / Associate Professor / Assistant Professor jobs vacancies. Interested and eligible job aspirants are requested to apply as soon as possible from 22nd July 2018. Check out further more details below. About College: PERI Institute of Technology (PERI IT) was established in 2010 by the PERI Educational and Charitable Trust with the objective of providing quality technical education. The Institute is built at Mannivakkam, Chennai in a sprawling area of 15 acres replete with A/C classrooms, well equipped labs, A/C transport, cafeteria and a vast library. How to Apply: Eligible and interested candidates are required to send a copy of their Bio-data, Photographs and copies of Certificates to the following email address.